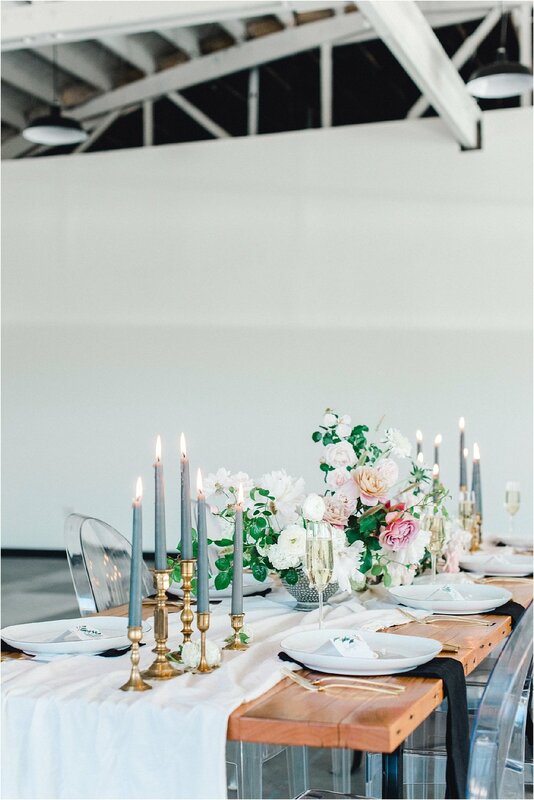 Portland has some of the best modern industrial wedding venues in the PNW. It’s easy to see why these top Portland wedding venues have become the place to tie the knot for both local and destination couples. Open floor plans, unfinished wood, weathered concrete and huge light filled windows makes these venues the best wedding venues in Portland, OR for designing your modern industrial wedding, whether it’s rain or shine. Because let’s face it… there’s a good chance it might be raining but that doesn’t have to stop the party! We love the following wedding venues in Portland because their modern industrial aesthetic is spot on. Plus they’re perfect for large scale floral ceremony installations, hanging reception flowers and memorable photo booth backdrops! Check out our list of the Top Portland Wedding Venues below. Union/Pine is the quintessential Portland wedding venue with lots of bright light, big windows and reclaimed wood walls. With both a main venue on the first floor and a more intimate loft space upstairs Union/Pine is the perfect fit for any size wedding! Located in SE Portland’s industrial area, the main venue space can accommodate nearly 300 people while the loft fits 40 of your closest family and friends. They also have their own collection of in-house furniture rentals to create cozy lounge areas, ceremony seating and reception accents. The Colony is the perfect venue for dark, moody, industrial weddings located right in the heart of the St Johns neighborhood, in North Portland. It features rich concrete floors, black velvet curtains and super heigh ceilings. The main ballroom holds 150 - 250 people depending on floor plan. The Colony also has lodging from fully furnished apartments to cozy renovated 1970’s trailers. Perfect for getting your bridal party ready on-site or for out of town guests! The Evergreen is modern industrial perfection with exposed brick walls, vaulted windows and open floor plan. Located in SE Portland, The Evergreen can hold up to 550 people combined on both the main floor and overlooking mezzanine. They also have an on-site bridal suite for getting photo ready or any reception outfit changes you might be planning. Hello, Beyonce! Castaway is a hidden gem in Portland’s NW industrial district and our top pick for best downtown wedding venue. With enough space for a huge reception or big dance floor, Castaway can accommodate up to 1000 people between their indoor and outdoor spaces! If you’re looking for a more intimate setting, Blockhouse is their newly opened venue with seating for 60 people, located right next to Castaway and directly behind Pomarius Nursery. If you book either Castaway or Blockhouse, be sure to snap some first look photos in the greenhouse! Click here to learn more about floral design by Metal + Moss or if you're ready to dive in and start planning your elopement or wedding with us then get in touch! Leave your comments below and let us know what your favorite wedding venues are in Portland. We can't wait to hear from you!